For eye-catching, vivid colours with stark contrasts, few blooms outshine Poppy Anemone 'Hollandias'. Gorgeous 2-inch saucer shaped flowers have brilliant crimson petals that turn bright white at their centres, where they contrast with deep red mounds of pistils and stamens. Blooming in late spring to early summer, these showy, deer-resistant beauties come back year after year in a startling display of rich red against startling white. In the fall, plant poppy anemone 'Hollandias' (Anemone coronaria 'Hollandia') in well-drained clay, loamy or sandy soil, in clusters 3 inches deep and 2 to 4 inches apart. They thrive in zones 6 to 9 in full sun to part shade, reaching from 10 to 14 inches tall. Because their foliage tends to drop off once they bloom, you may wish to pair them with leafier companion plants, such as asters or geraniums. Perfect in low borders or along sidewalks or pathways, poppy anemone Hollandias are particularly well-suited to rock gardens. These striking perennials are an excellent choice for planters and other containers, and add bright splashes of colour to naturalised areas. These dazzling flowers are also ideal for the cutting garden, as they work beautifully either in loose, casual floral arrangements or alone in vases. 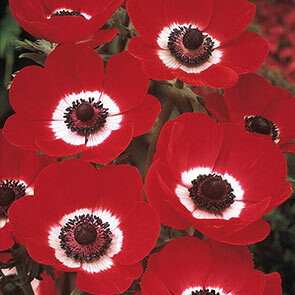 Add a dash of colour and excitement to almost any area with bright, vibrant poppy anemone 'Hollandias'. Weeks of striking cut flowers.